Instead of purchasing a bunch of furniture and entertainment for your kid's next birthday party, why not rent some? We have here a complete guide to kid's party rentals in MA. These kid's party rental services in MA offer it all, from tables to bouncy houses! View a complete list of party rentals in MA at KidsParties.Party, including outdoor tent rentals and trackless trains. If you want to throw your kid a birthday party of a lifetime, then here's an idea: create a carnival in your own backyard with these carnival rentals MA! Find all the coolest carnival rentals MA has to offer here. 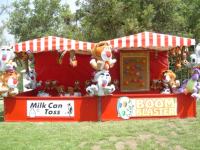 Throw your child the most unforgettable party of his or her life by renting some fun carnival rides! 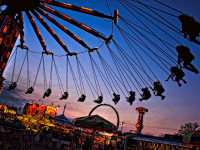 You can turn your own backyard into a carnival with these carnival ride rentals MA! Your child and friends will have an absolute blast trying to dunk their friend or family member into the tank, or maybe even being in the tank themselves! Check out these fun dunk tank rentals MA. If you're looking for a means of endless entertainment for party guests of all ages, then renting a bounce house is definitely a great idea. 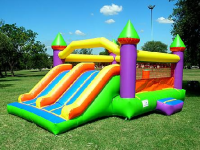 Check out this list of inflatable rentals MA. 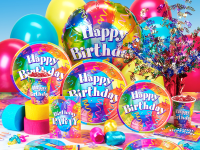 Look no further for a complete list of kid's party supply rentals in MA! You can find here a large variety of items to make your kid's next birthday party unforgettable! Providing both fun-filled entertainment and lasting memories, photo booths are a great addition to any party. 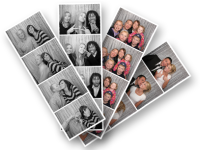 So, take a look through this complete guide to photo booth rental rentals MA.